Lateral Thinking the Key to Arts Project by Cairns Regional Council. Lateral thinking in the creativity process has led to a new collaborative arts project in Port Douglas. This lateral thinking and a willingness to innovate and do things a little differently led to a ‘win-win’ situation for artists and managers in Port Douglas. How would you define lateral thinking and innovation ? The closest that I can get to a definition is ‘out of the box thinking’ and developing problem solving steps that lead to a new way of doing something, in order to bring creative ideas to life. At the Meridien Marina in Port Douglas we had the situation of beautiful, elegant shops, in a whole wing of the marina complex, closing down as the building’s owners had decided to demolish the twenty-year-old speciality shopping facility in a year or two to make way for up-market holiday and residential accommodation. They were therefore unable to offer to renew existing leases. Psychologically this was bad news for the remaining shops and their customers. After all, unless you are looking for spooky masks or scarey adventures, who wants to shop in a ghost town? This is where lateral thinking came in. Headed up by Cairns Regional Council’s Manager, Terri Golding-Clarke and Meridien Marina Manager, Steve Boucher, the creativity process kicked in, resulting in a plan to invite selected, professional artists to set up studios and galleries to showcase their paintings, jewellery, photography, fashion and craft. And so this collaborative project began in October, 2010. Artists busily scrubbed and painted their shops, putting their own individual ‘stamp’ on the interior design, displaying finished pieces and making efficient work-spaces where possible. 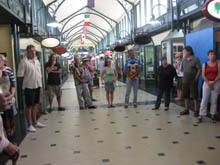 By Christmas, the ‘artists’ mall’ was a buzz of activity with visitors, even at this traditionally quiet time of the year, enjoying watching artists at work and chatting with them. Once the programme of special events - face painting, coconut basket weaving, hula dancing entertainment, portrait painting and so on began, the Beautiful art Spaces in the Artists’ Mall would have been 'the place to be'. Surely a win-win result for creative lateral thinking? Or should we say “One Won”? 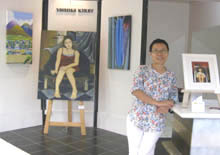 Yoshiko Kirby, Terry Johnson, Jill Booth and Michael Edwards set up their Port Douglas Artists studio and gallery in Shop 21. 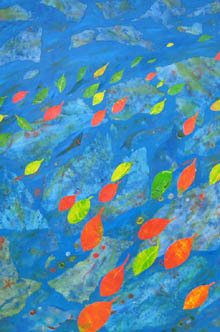 All painters, they have different approaches to their work and various messages to convey. 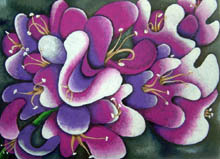 Michael has also developed a beautiful range of elegant silver and gold jewellery and Jill often paints or prints on silk and other fabrics. 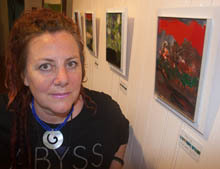 Tania Heben worked hard towards an exhibition at the Cairns Regional Gallery in her spacious studio at Number 30. 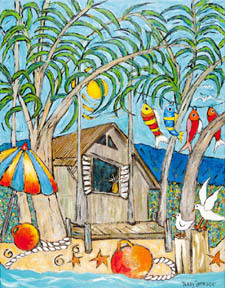 Tania's distinctive oil paintings of the beauty of the Far North Queensland region capture people's hearts. She has many prints available as well as originals, so visitors can take home a little memory of their stay here - and serious collectors a large one! 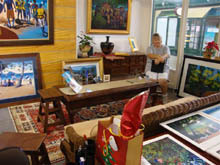 Yolande and Guido set up their Galleria dell'Arte in Shop 26 at the Meridien Marina. 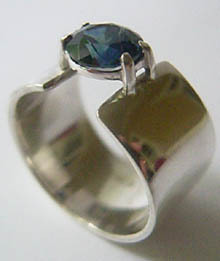 Specialising in handcrafted 'one off' designer jewellery they also stocked varied artwork by local artists of the region. They were happy to make jewellery to order - so now's your chance to own and wear a piece of jewelry that nobody else in the whole world has! 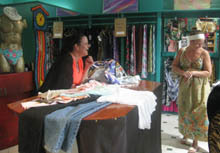 'Dare To Be Original' was the catchy name of Dorothea and Paul's designer clothing shop at 27, Meridien Marina, before moving to Cairns. Featuring cotton African prints designed and made on the premises into casual, affordable dresses, tops, pants and skirts, this is style and comfort not to be missed. The distinctive imported pure cotton fabric is also available by the metre. 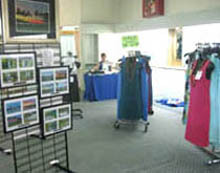 Heather and Allen opened their businesses ‘Memories of Port Douglas Photography’ and ‘Chuck-Ons and Other Things’ at Shop 34. Allen’s photos are untouched, natural pictures. They shared the space with Heather’s clothing which is also natural and relaxed – just the thing to ‘chuck on’ around the house or over a swimsuit, an innovative and comfortable range. Cheryl Harrison, from Sideways Gallery, Shop 23, works in various mediums to produce both two and three dimensional contemporary abstract artwork. 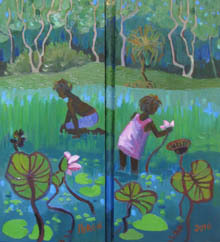 Her inspiration comes from observation of the natural world and how it intersects with us as individuals and as a collective. 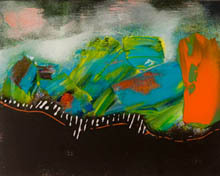 Displayed were ‘jewels’ of small, abstract paintings, which you would have found difficult to resist. 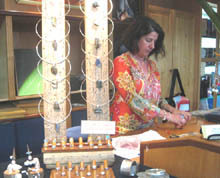 Fashion designer, Cindi Liggins' creations vibrate with energy and colour. 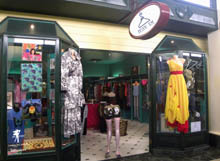 At 'Funk Em' Boutique, Shop 16, she presented swimwear, formal wear, and children's fashion and accessories; her inspiration is endless. Take her your worn, loved clothing and she will 'funk em' for you! As well as an eclectic display of lively local craft and beautiful artworks, including indigenous paintings and artefacts, Melissah, from Studio Jellyfish at Shop 29, gathered together a collection of historical relics for your interest. So creative, lateral thinking has been critical in developing a project that had the potential to bring benefits to the Arts and Tourism industries of North Queensland. 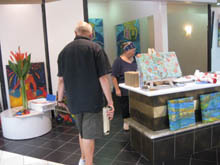 Some of the artists from this Port Douglas Beautiful Art Spaces project moved to shops in Orchid Plaza or The Pier Marketplace in Cairns when it came to an end in March 2012. 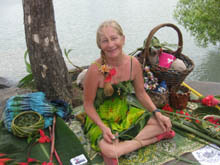 Others moved into rented premises in Port Douglas or decided to work from their home studios.